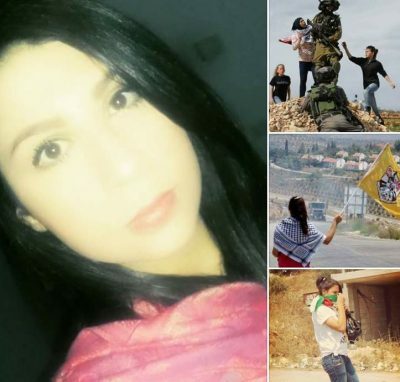 Following the highly-publicized abduction of 16-year old Ahed Tamimi on Tuesday, along with her mother, Israeli soldiers entered the town of Nabi Saleh again early Wednesday morning and abducted Noor Tamimi, one of Ahed’s relatives, from her bed. Noor and Ahed are apparently being targeted for a video that went viral last week showing the two girls and Ahed’s mother pushing two soldiers, then standing hand-in-hand and telling the soldiers to leave their home. The soldiers, armed with assault rifles, had invaded the town of Nabi Saleh and the Tamimi family home. The Israeli military was insulted that teen girls would push their heavily armed soldiers, and the army spokesperson said the girls should have been handcuffed on the spot and taken to an Israeli military camp immediately. Palestinians in the West Bank and Gaza live under martial law, with the Israeli military having full jurisdiction over every aspect of their lives – despite the fact that this kind of governance violates Israel’s duties as an occupying military force since 1967. Noor has had a similar experience and background in the nonviolent movement in Nabi Saleh, where the town has engaged in weekly non-violent protests for over a decade against the Israeli military occupation and the Annexation Wall. She has witnessed relatives attacked and killed by the Israeli military on numerous occasions. In response to the video of the girls pushing the soldier, the Israeli Minister of Education Naftali Bennett and member of the Yisrael Beitenu party said they should be put in prison for life. In addition, Yinon Magal, a former Knesset member, said that he hoped Elor Azaria would come to Nabi Saleh. The implication of Magal’s statement is chilling – that a convicted murderer, Elor Azaria (who was convicted of shooting a wounded Palestinian in the head execution-style), should shoot and kill two unarmed teenage girls for standing up to an invading military with their bare hands and their voices. No charges have been filed against the two girls and Ahed’s mother, but local sources say they will appear in a military court on Friday.